For other people with similar names, see Chris Davis. Khristopher Adrian Davis (born December 21, 1987), nicknamed “Khrush”, is an American professional baseball left fielder and designated hitter for the Oakland Athletics of Major League Baseball (MLB). He previously played for the Milwaukee Brewers. Davis played for the Brewers from 2013 through 2015, and has played for Oakland since 2016. He led MLB with 48 home runs in the 2018 season. Davis was born in Lakewood, California. He played baseball at Deer Valley High School in Glendale, Arizona, where he was twice named an All-State player. During his senior season at Deer Valley, Davis hit .592 with ten home runs and 50 RBIs to lead the team to a state title. Davis attended California State University, Fullerton, where he played college baseball for the Cal State Fullerton Titans as an outfielder, designated hitter, and pinch hitter. In his junior season, Davis hit .328 with 16 home runs and 58 RBIs. In 2006, Davis was first drafted by the Washington Nationals in the 29th round; he did not sign with the team but opted to play college baseball. He later was drafted by the Milwaukee Brewers in the seventh round of the 2009 Major League Baseball draft. Davis began his minor league career in 2009. He played in one game for the Helena Brewers of the Rookie-level Pioneer League club and ten games for the Arizona League Brewers; Davis combined for two home runs and a .237 batting average. He spent the entire 2010 season playing for the Wisconsin Timber Rattlers of the Class A Midwest League. He played in 128 games with 22 home runs and a .280 batting average. To start the 2011 season, Davis was promoted to the Brevard County Manatees of the Class A-Advanced Florida State League. After 90 games, he was promoted to the Huntsville Stars of the Class AA Southern League; Davis played 35 games with the team. In 125 games that year, he batted .280 with 84 runs batted in (RBIs) and 17 home runs. In 2012, Davis returned to the Arizona League Brewers and the Hunstville Stars for six and 44 games respectively. The Brewers promoted Davis to their top level below the Major Leagues with the Nashville Sounds of the Class AAA Pacific Coast League. He played in 32 games for the Sounds with a .310 batting average. The Brewers added Davis to their 40-man roster during the 2012–13 offseason. After a productive spring training, Davis made the final roster cut and made his major league debut on opening day, grounding out in a pinch-hit appearance. Five days later, Davis made his first major league start in left field and recorded his first major league hit, a double off Patrick Corbin of the Arizona Diamondbacks. After a poor start that saw him bat just .188, Davis was optioned to Nashville. 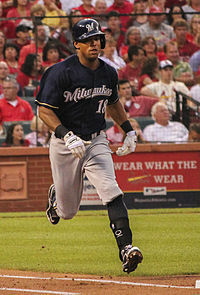 Davis was recalled in mid-July, and after Ryan Braun's suspension due to performance-enhancing drug use, became the Brewers' starting left fielder down the stretch. He hit his first major league home run at Miller Park on July 23 off Colt Hynes of the San Diego Padres. Davis ended the year with 11 home runs in 136 at-bats, with a slugging percentage of .596. Davis' rookie performance was enough to encourage Brewers management to trade right fielder Norichika Aoki to Kansas City and move Ryan Braun from left to right field, opening up an everyday role for Davis. After a slow start, batting .219 with an on-base percentage of .250 and a slugging percentage of.388 through May 20, Davis hit four home runs in six games. At the All-Star Break, Davis led the Brewers with 15 home runs. In 144 games for the Brewers, Davis hit .244 with 22 home runs and 69 RBIs. Davis was once again named the starting left fielder for the Brewers during the 2015 season and batted .247 with 27 home runs and 66 RBIs in 121 games. On February 12, 2016, the Brewers traded Davis to the Oakland Athletics for Jacob Nottingham and Bubba Derby. On May 17 in a game against the Texas Rangers, Davis hit three home runs, including a walk-off grand slam for the third. This was only the second time this has happened in MLB history. On August 14, 2016, Davis hit his 30th home run of the season, a two-run homer against the Seattle Mariners. On September 18, 2016, Davis hit his 39th and 40th home runs of the season in a game against the Rangers. He added two more home runs to conclude the season. He also contributed 102 RBIs for the season, becoming the first player in the franchise to hit 100 or more RBIs since the 2006 season, when Frank Thomas had 114 RBIs for the Athletics. The following season, in 2017, Davis hit 43 home runs and contributed 110 RBIs, being the first Athletics player to have back-to-back 40 home run seasons. In 2018, his 48 home runs led all of MLB. He also batted .247 for the fourth consecutive season. His 123 RBIs were the second-most in baseball behind J. D. Martinez. For the season, he had the lowest line drive percentage of all major league hitters (15.9%). Davis was invited by Bobby Magallanes to play for the Mexican team. He planned to represent the country of his mother's birth in the 2017 edition of the World Baseball Classic, but he did not play in the tournament. Davis' father, Rodney, played in the Los Angeles Dodgers organization and has served as a scout for the Dodgers and Arizona Diamondbacks. His mother, Sonia Davis (née Alarcón), was born in Culiacan, Sinaloa, but grew up in Ensenada. 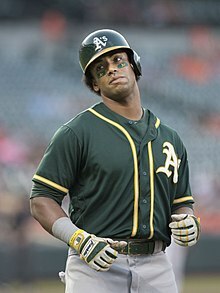 ^ a b c d e f g h i j k l "Khris Davis". MiLB.com. Minor League Baseball. April 6, 2013. Retrieved April 5, 2013. ^ a b "BIO Preview for /sports/m-basebl/mtt/davis_khris00.html". Cal State Fullerton Athletics. Retrieved February 13, 2016. ^ "Khris Davis Baseball Statistics [2007-2017]". www.thebaseballcube.com. ^ Tom Haudricourt. "Brewers add five to 40-man roster". Archived from the original on February 16, 2016. Retrieved February 13, 2016. ^ Haudricourt, Tom (March 16, 2013). "Brewers thinking about keeping Khris Davis". Milwaukee Journal Sentinel. Retrieved April 6, 2013. ^ "Brewers trade Norichika Aoki, likely means Braun to RF". USA Today. Associated Press. December 5, 2013. Retrieved August 7, 2014. ^ "Khris Davis Statistics and History - Baseball-Reference.com". Baseball-Reference.com. Retrieved February 13, 2016. ^ "Khris Davis 2015 Batting Game Logs". Baseball-Reference.com. Retrieved August 7, 2018. ^ Haudricourt, Tom (February 12, 2016). "Brewers trade Khris Davis to Athletics for catching prospect, pitcher". Milwaukee Wisconsin, Journal Sentinel. Retrieved February 13, 2016. ^ Hall, Alex (May 18, 2016). "The 5 best things about Khris Davis' walk-off grand slam". SB Nation. Retrieved May 18, 2016. ^ "Seattle Mariners at Oakland Athletics Box Score, August 14, 2016". Baseball-Reference.com. Retrieved August 7, 2018. ^ "Oakland Athletics at Texas Rangers Box Score, September 18, 2016". Baseball-Reference.com. Retrieved August 7, 2018. ^ "Khris Davis 2016 Batting Game Logs". Baseball-Reference.com. Retrieved August 7, 2018. ^ "A's notes: For Davis, going yard is part of the job description". NBCS Bay Area. September 29, 2016. Retrieved August 7, 2018. ^ "Khris Davis 2017 Batting Game Logs". Baseball-Reference.com. Retrieved August 7, 2018. ^ Lee, Jane (May 24, 2018). "Khris Davis hits .247 for 4th straight year". MLB.com. Retrieved October 4, 2018. ^ Bambino Sedano (October 8, 2016). "Khris Davis, jonronero mexicano de Atléticos" – via YouTube. ^ "Brewers: Rookie Khris Davis' ride 'surreal' for his dad". madison.com. April 12, 2013. Retrieved February 13, 2016. ^ "A's outfielder Khris Davis to play for Mexico in World Baseball Classic". December 5, 2016. ^ "Khris Davis jugará con el Tri de beisbol". Vanguardia. September 9, 2016. 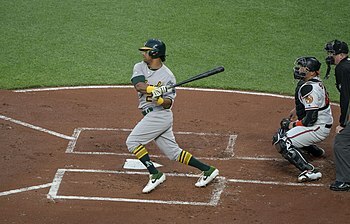 Wikimedia Commons has media related to Khris Davis. This page was last edited on 15 April 2019, at 02:03 (UTC).